The Bible Hill Elementary School is located within the agrarian landscape of Bible Hill. Three main areas animate the new school: welcoming entry and common areas; student support and resources; and the learning street. The learning street is a flexible learning environment and central shared collaborative zone. It links more formal learning spaces such as classrooms to collaborative and shared spaces. It incorporates the art room, library and circulation areas. Places for wet or messy activities, active group work, quiet individual and group activities, are shaped using agile furnishings, which are easily rearranged to suit a variety of activities. Daylight infuses the space from the clerestory and the large windows. 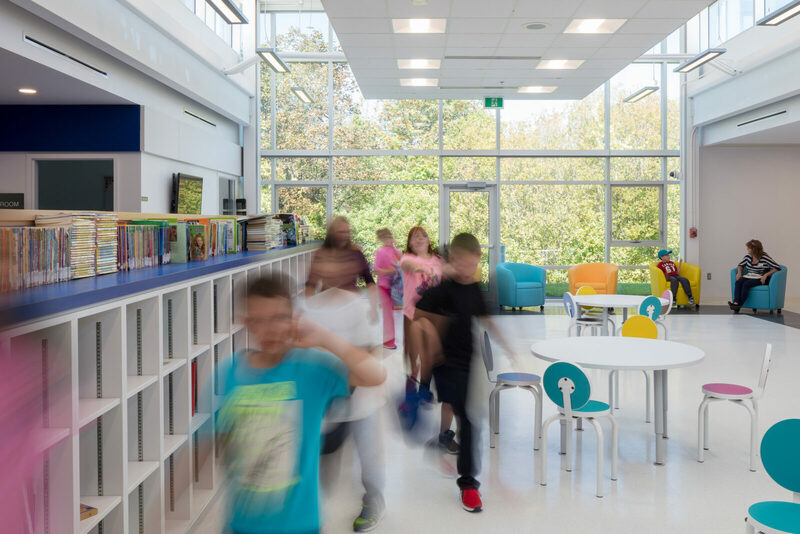 The plan recognizes that each student learns differently and that individual learning styles must be accommodated in both the educational programme and the design of the learning spaces. The learning street responds to a need for a variety of types of learning spaces, and for adventitious learning outside of formal teaching areas.